Just a little background here - Bolt Burgers has been in the works for a long time. It's a creation sprung from the imagination of a few different groups headed by Mike Davidson, Joe Spinelli and Troy Clayton. Mike is an optician by trade, Joe is the man behind the scenes in the Mid-Atlantic restaurant business (trust me, you've been somewhere he's touched, likely on a daily basis) and Troy is a chef/owner of a restaurant in Alexandria. 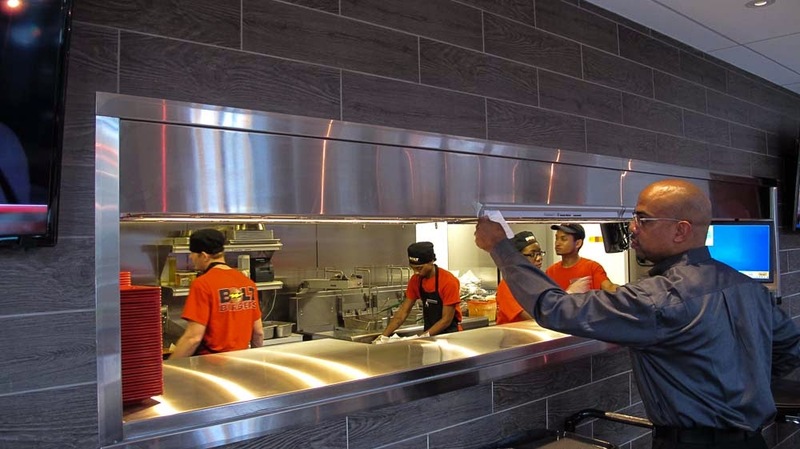 What's different about this burger place? A lot. 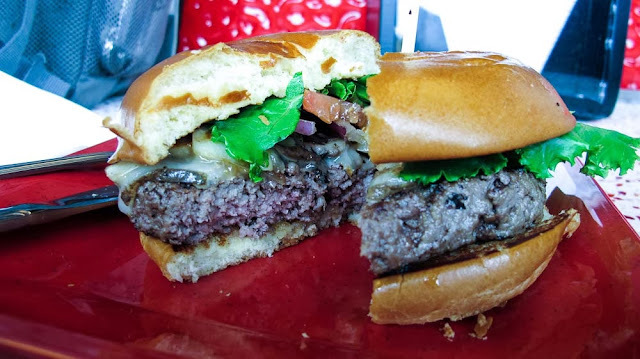 Anyone can cook a burger, but not everyone can cook a real (read not-fast-food) burger to the same temp over 1000 times a day without breaking a sweat. Not everyone has custom blended spices and sauces, and not everyone uses this much technology to make it happen. As always, I head straight for the kitchen. I like to see what's going on and what it looks like. Shiny stainless, employees with clean uniforms, nothing on counters that shouldn't be there. Check. Looking good. You may have noticed the screen to the right of the manager in the previous picture. That is a Kitchen Display Screen. It's more than just a representation of a ticket, it's information. From glancing at the screen you can tell how long any ticket has been in the kitchen, which prep area is finished with a given ticket (or not,) how many orders aren't currently showing on the screen yet, and which orders are done and waiting to be delivered to guests. The oldest done ticket is always in the upper left-hand corner with a blinking border so it's always the first one to go out and you don't mix up peoples' orders. 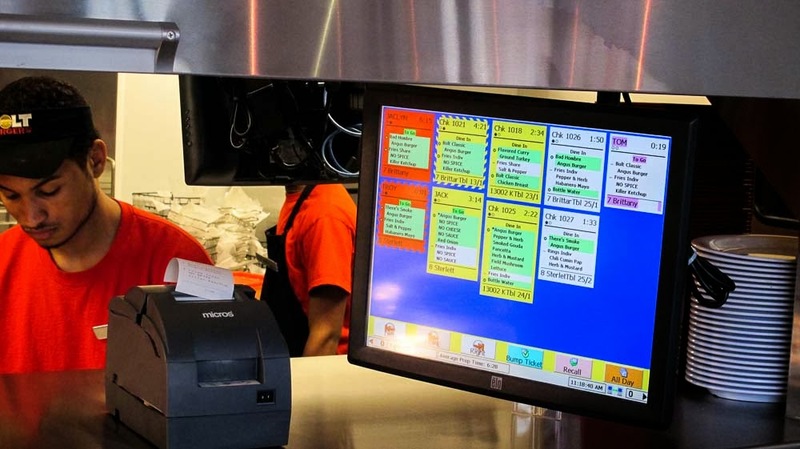 It can also show trainees how to assemble a certain dish, handle prep work, show nutritional info/ingredients, or display training videos. Cool stuff. 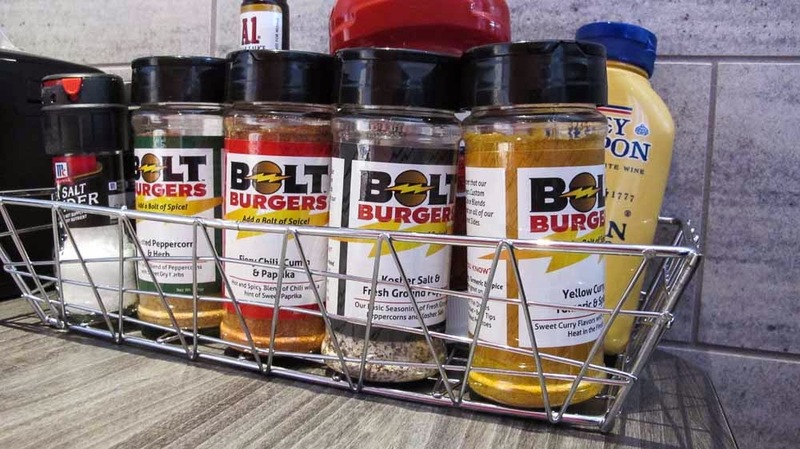 Bolt Burgers lets you order your way not only with regards to food, but in the way you actually get your order into the kitchen. You can walk in, get your table number, and walk up to one of the kiosks placed around the restaurant and order yourself. Once you've gone through it once, you may decide to stick with that route as it's easy and if you mess up your order you only have yourself to blame! 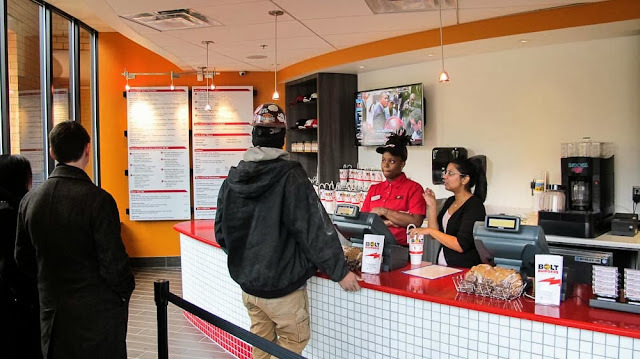 You can go to the walk-up counter and order from a person. This might not be a bad idea the first go-round as they've got some specialty burgers you might want to know about. I had one and it was pretty darned tasty. This is the Mr. Truffleupagus. As my frequent readers know, I'm a fool for truffles, so I had to give it a shot. It comes with truffled Pecorino cheese and sauteed mushroom. Nicely done. Good beef and a very nice bun too. It was cooked to a perfect medium. I'm sure they'd custom cook one for you if you ask. These are cute, aye? 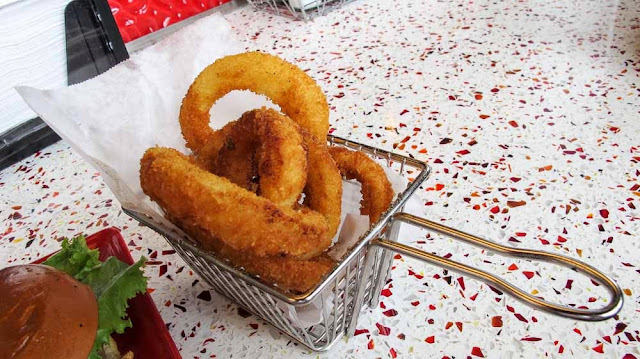 The fries/rings come in a mini-fry basket. They were good too! I tried a little of each of the custom spice mixes and I particularly like the curry and the chili-cumin. After you input the order and swipe your card, a receipt prints out at the host stand and they bring you a copy and collect the mTablet. Very slick. The final option for ordering is web, which is coming soon. 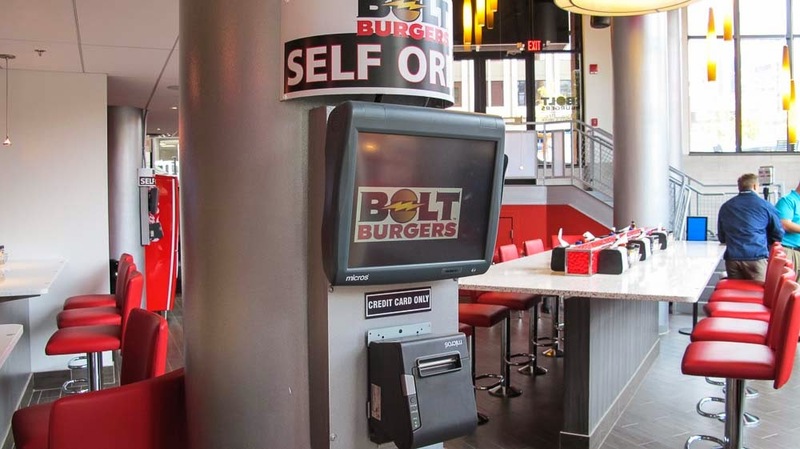 You'll be able to order from your phone, desktop, iPad, iPod Touch, Tablet, however you interact with the web. These guys/gals involved have put a lot of thought into what they're doing and it shows. I'd expect to see more of these rolling out in the near future. If you stop in, tell them where you read about it. If you've got questions about the technology, feel free to drop me a line.